Various gram-negative animal and plant pathogens use a novel, sec-independent protein secretion system as a basic virulence mechanism. It is becoming increasingly clear that these so-called type III secretion systems inject (translocate) proteins into the cytosol of eukaryotic cells, where the translocated proteins facilitate bacterial pathogenesis by specifically interfering with host cell signal transduction and other cellular processes. Accordingly, some type III secretion systems are activated by bacterial contact with host cell surfaces. Individual type III secretion systems direct the secretion and translocation of a variety of unrelated proteins, which account for species-specific pathogenesis phenotypes. In contrast to the secreted virulence factors, most of the 15 to 20 membrane-associated proteins which constitute the type III secretion apparatus are conserved among different pathogens. Most of the inner membrane components of the type III secretion apparatus show additional homologies to flagellar biosynthetic proteins, while a conserved outer membrane factor is similar to secretins from type II and other secretion pathways. Structurally conserved chaperones which specifically bind to individual secreted proteins play an important role in type III protein secretion, apparently by preventing premature interactions of the secreted factors with other proteins. The genes encoding type III secretion systems are clustered, and various pieces of evidence suggest that these systems have been acquired by horizontal genetic transfer during evolution. Expression of type III secretion systems is coordinately regulated in response to host environmental stimuli by networks of transcription factors. This review comprises a comparison of the structure, function, regulation, and impact on host cells of the type III secretion systems in the animal pathogens Yersinia spp., Pseudomonas aeruginosa, Shigella flexneri, Salmonella typhimurium, enteropathogenic Escherichia coli, and Chlamydia spp. and the plant pathogens Pseudomonas syringae, Erwinia spp., Ralstonia solanacearum, Xanthomonas campestris, and Rhizobium spp. Although flagella, motility and/or chemotaxis have been implicated as important for biofilm formation in other organisms (Lawrence et al., 1987; Korber et al., 1989; 1994; DeFlaun et al., 1994; Graf et al., 1994; Mills and Powelson, 1996; Vidal et al., 1998), their precise roles in this process have not yet been defined. We reasoned that there are three mechanisms through which flagella might be required. First, it is possible that flagella could be directly required for attachment to abiotic surfaces, thus facilitating the initiation of biofilm formation (e.g. as with tethered cells). Alternatively, motility could be necessary to enable a bacterium to reach the surface (e.g. to move through surface repulsion present at the medium-surface interface). Also, motility might be required for the bacteria within a developing biofilm to move along the surface, thereby facilitating growth and spread of the biofilm. Finally, it is possible that chemotaxis is required for the bacteria to swim towards nutrients associated with a surface. As flagellar synthesis, motility and chemotaxis have been extensively studied in E. coli (Macnab, 1996; Stock and Surette, 1996), well-defined mutations that inhibit each of these three aspects of flagellar function are available. Accordingly, we obtained the following mutations: (i) fliC ::kan (strains harbouring this allele are unable to synthesize flagellin) and flhD ::kan (a master regulator of flagellar synthesis whose absence confers an inability to synthesize flagella); (ii) motA, motB and motAB (lesions that do not inhibit flagellar biosynthesis but render cells non-motile or paralysed); and (iii) cheA-Z ::kan (strains harbouring this lesion are motile but non-chemotactic). Each of these alleles was moved into 2K1056 via P1vir transduction, and the resulting strains were analysed for their ability to form biofilms. Construction of these strains provided us with the tools required to distinguish between the possible roles of flagella/motility/chemotaxis that were detailed above. First, the simple microtitre dish assay used in our screen revealed that motile cells that are non-chemotactic ( cheA-Z ::kan) appear to form biofilms indistinguishable from their wild-type counterpart. In contrast, cells either lacking flagella (fliC ::kan, flhD ::kan) or possessing paralysed flagella ( motA, motB, or motAB ) were severely defective in biofilm formation (Fig. 2). When biofilm formation was quantified over time (Experimental procedures), it became very clear that, under these conditions, chemotaxis is completely dispensable for normal biofilm formation (Fig. 3). In contrast, cells either lacking complete flagella (fliC ::kan) or possessing paralysed flagella ( motA, motB, or motAB ) are severely hindered in the initial stages of biofilm formation (Fig. 3). More detailed analysis of the defects conferred by these alleles was obtained through microscopic analysis of cells attached (or the absence of such attached cells) to PVC after growth in LB. As illustrated in Fig. 4A and B, motile cells that are non-chemotactic are able to form biofilms that are indistinguishable at the cellular level from the biofilms formed by wild-type cells. In contrast, non-flagellated or paralysed cells attach poorly to PVC. Moreover, the few cells that do attach are often located in small, dense clusters of cells (Fig. 4D). As mentioned above, the macroscopic analysis of biofilm formation of fim mutants was analogous to that observed with the motility-defective mutants (i.e. clear wells after staining with CV) (Fig. 2). However, microscopic analysis of these mutants revealed distinct phenotypes. Specifically, fim mutants are even more dramatically defective in initial attachment than are the paralysed and non-flagellated cells. As illustrated in Fig. 4C, most microscopic fields had no cells attached at all, and only infrequently were a few attached cells observed. This observation indicated that type I pili are critical for initial interaction with abiotic surfaces such as PVC. Perhaps the cap protein is a modified filament/axial family protein as well? Interactions between bacterial flagellar axial proteins in their monomeric state in solution. Furukawa Y, Imada K, Vonderviszt F, Matsunami H, Sano K, Kutsukake K, Namba K.
Protonic NanoMachine Project, ERATO, JST, 3-4 Hikaridai, Seika, Kyoto 619-0237, Japan. The axial structure of the bacterial flagellum is composed of many different proteins, such as hook protein and flagellin, and each protein forms a short or long axial segment one after another in a well-defined order along the axis. Under physiological conditions, most of these proteins are stable in the monomeric state in solution, and spontaneous polymerization appears to be suppressed, as demonstrated clearly for flagellin, probably to avoid undesirable self-assembly in the cytoplasmic space. However, no systematic studies of the possible associations between monomeric axial proteins in solution have been carried out. We therefore studied self and cross-association between hook protein, flagellin and three hook-associated proteins, HAP1, HAP2 and HAP3, in all possible pairs, by gel-filtration and analytical centrifugation, and found interactions in the following two cases only. Flagellin facilitated HAP3 aggregation into beta-amyloid-like filaments, but without stable binding between the two. Addition of HAP3 to HAP2 resulted in disassembly of preformed HAP2 decamers and formation of stable HAP2-HAP3 heterodimers. HAP2 missing either of its disordered terminal regions did not form the heterodimer, whereas HAP3 missing either of its disordered terminal regions showed stable heterodimer formation. This polarity in the heterodimer interactions suggests that the interactions between HAP2 and HAP3 in solution are basically the same as those in the flagellar axial structure. We discuss these results in relation to the assembly mechanism of the flagellum. A cap at the tip of the bacterial flagellum uses a dynamic differential binding of individual subunits to allow the filament tip to grow, achieving control of assembly far from the point of protein translation. Even though there is clear evidence that the flagellar filament can self assemble11, the cap of the flagellar filament serves to control its assembly12. The cap enables the filament to polymerize with high efficiency, so that every filament subunit that reaches the tip inserts into place. At the same time the bacterium continues to secrete other proteins through the filament that are presumed to simply pass by the cap and out into the extracellular medium. These include excess hook-filament junction subunits13, excess cap14 and a negative regulator of flagellin gene transcription15. This suggests that the cap acts as a gatekeeper that selectively retains filament subunits and may even play a role in helping them to fold into place. Rhodobacter sphaeroides is a photosynthetic bacterium which swims by rotating a single flagellum in one direction, periodically stopping, and reorienting during these stops. Free-swimming R. sphaeroides was examined by both differential interference contrast (DIC) microscopy, which allows the flagella of swimming cells to be seen in vivo, and tracking microscopy, which tracks swimming patterns in three dimensions. DIC microscopy showed that when rotation stopped, the helical flagellum relaxed into a high-amplitude, short-wavelength coiled form, confirming previous observations. However, DIC microscopy also revealed that the coiled filament could rotate slowly, reorienting the cell before a transition back to the functional helix. The time taken to reform a functional helix depended on the rate of rotation of the helix and the length of the filament. In addition to these coiled and helical forms, a third conformation was observed: a rapidly rotating, apparently straight form. This form took shape from the cell body out and was seen to form directly from flagella that were initially in either the coiled or the helical conformation. This form was always significantly longer than the coiled or helical form from which it was derived. The resolution of DIC microscopy made it impossible to identify whether this form was genuinely in a straight conformation or was a low-amplitude, long-wavelength helix. Examination of the three-dimensional swimming pattern showed that R. sphaeroides changed speed while swimming, sometimes doubling the swimming speed between stops. The rate of acceleration out of stops was also variable. The transformations in waveform are assumed to be torsionally driven and may be related to the changes in speed measured in free-swimming cells. The roles of and mechanisms that may be involved in the transformations of filament conformations and changes in swimming speed are discussed. The main "problem" with Smart's paper is basically that, with such a clear grasp of the definition vs. evolvability distinction, and of the various complexities of biology that have to be taken into account when defining multiple-parts-required systems (which is basically what he boils the concept down to), he really should just come on over to the evolutionist side and conceed that IC is not the forbidding barrier to evolution that it has so often been claimed to be! Smart explicitly acknowledges (in a way that I don't recall other IDists doing, certainly not emphasizing -- he sort of says that Julie Thomas did this, but as far as I can recall she looked at "parts present in multiple organisms" vs. "parts found to be required in multiple organisms") the common biological fact that homologous multiple-parts required systems with the same function, often have parts that are required in one system, but not in another! As RBH points out, unless one is going to invoke a multitude of mini-ID events for each of these "extra" required proteins in various systems (Hagemann factor is an example, it is at least very important in humans (defects are associated with miscarriages etc.) but in whales it is just a pseudogene), then the "IC barrier" has already been breached, probably by the "incremental indispensability" argument. ...which all seems to point towards the potential of all of these proteins being modified copies of each other (many of them are already in the "axial protein family". And the cap proteins might even be modified axial family proteins themselves -- e.g., the cap-filament interactions are similar to filament-filament interactions; it takes about 5 filament proteins to complete a turn of filament, and the cap is a pentamer of cap protein. 1. A secretion system (BTW, Smart calls it an "excretion" system -- this is probably not the best term IMO :-) ). Secretion systems are ubiquitous functional structures in life. 2. A extracellular extension (secretion system + extension = pili). Pili are ubiquitous functional structures in life. 3. A stator/motor, which just happens to independently associate with the rest of the structure, and just happens to have phylogenetically widespread homologs that function in much simpler contexts. ...each of which are functional in nonflagellar contexts. ...but certainly the "big picture" is that the "unscalable cliffs" of this IC system seem much reduced. Smart writes, "Critical responses to irreducible complexity have primarily consisted of just-so-stories that substitute vague appeals to chance or other forces for well-thought-out counter-arguments." And actually, I think that there is some truth to this. You can go through the book reviews of Behe and find that very few do more than vague just-so stories. Part of the reason is that detailed discussions are impossible in book reviews, but much of it is that the various philosophers and organismal biologists that replied simply didn't know much about the relevant biochemistry. There were a few exceptions, e.g. Cavalier-Smith (1997, TREE) cited a half-dozen of his own 30-page-plus papers on the origin of life and various systems, work which has continued in a massive fashion to the present day (do a PubMed search on Cavalier-Smith). When presented with detail and peer-reviewed literature on the evolution of this IC system, the IDist response was incoherant. So until someone like Smart delves into this literature and really grapples with it, and explains what exactly the IC system is and what all of these organisms with progressively simpler-yet-functional systems are doing, and how all of these evolutionary hypotheses have been proposed and tested in the field of evolutionary immunology when evolution didn't actually happen, all claims about evolutionists lacking in detail will be unimpressive. Finally, when Smart wrote, "Critical responses to irreducible complexity have primarily consisted of just-so-stories that substitute vague appeals to chance or other forces for well-thought-out counter-arguments" did it not occur to him that this is exactly what ID does? What is "IDdidit" except the vaguest just-so story ever told? It is not true, as has been claimed, that intelligent design theorists hold any system that has not been given a detailed evolutionary explanation as something that cannot be produced by evolution (see, for example, ). It is true, though, that there has been no detailed evolutionary explanation given for any irreducibly complex structure. A detailed evolutionary explanation does not mean that every base pair and selective pressure involved in the production of the system be accounted for, and every mutation explicitly stated on a timeline. On the other hand it does mean accounting for changes in phenotypes, and the advantages that those changes give. This final criterion for detail seems quite fair. I think that such things have been acheived for e.g. the immune system and the Krebs cycle. They are clearly constructable for the flagellum, although our evidence is much sparser there. However, what is the comparable standard of detail for an ID hypothesis? There must be some detail, or else nothing is ruled in or out by the hypothesis, and it becomes nonexplanatory and nontestable. 4) Is the Avida experiment which I'm sure RBH will discuss sufficiently. My only point would be that Smart's endorsement of the knock-out criterion would appear to clearly rule "in" the evolved EQU functions as IC. That's probably enough for the moment. I'm not sure if Smart himself has any interest in the discussion, but if he does, I'd like to say thanks for an interesting article, and that if he follows his logic just a very few steps further he will have one of the more thorough Behe rebuttals out there. Adhesion of enteropathogenic Escherichia coli to host cells. Nougayrede JP, Fernandes PJ, Donnenberg MS.
Division of Infectious Diseases, University of Maryland, Baltimore, 10 S. Pine Street, Baltimore, MD 21201, USA. Enteropathogenic Escherichia coli (EPEC) adhere to the intestinal mucosa and to tissue culture cells in a distinctive fashion, destroying microvilli, altering the cytoskeleton and attaching intimately to the host cell membrane in a manner termed the attaching and effacing effect. Typical EPEC strains also form three-dimensional microcolonies in a pattern termed localized adherence. Attaching and effacing, and in particular intimate attachment requires an outer membrane adhesin called intimin, which binds to the translocated intimin receptor, Tir. Tir is produced by the bacteria and delivered to the host cell via a type III secretion system. In addition to this well-established adhesin-receptor pair, numerous other adhesin interactions between EPEC and host cells have been described including those between intimin and cellular receptors and those involving a bundle-forming pilus and flagella and unknown receptors. Much additional work is needed before a full understanding of EPEC adhesion to host cells comes to light. Two thorough reviews of flagellar function (Berg) and assembly (Macnab) have recently come out. It took me a few hoops to find out where they actually reside online (pubmed, annoyingly, doesn't link to them), but here are the pubmed links and then links to the online stuff (if you have access). Annu Rev Biochem. 2002 Dec 11 [Epub ahead of print]. Epub 2002 Jan 02. 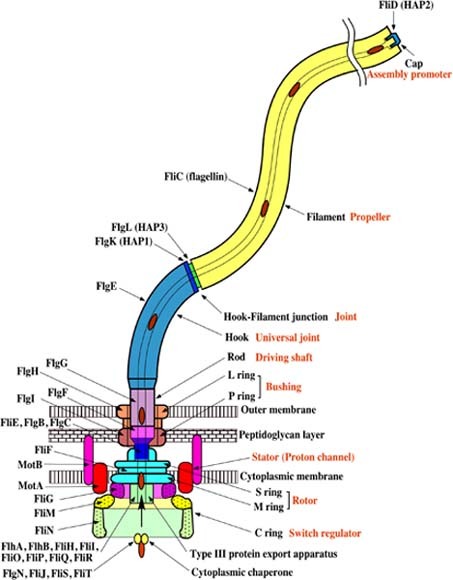 The Rotary Motor of Bacterial Flagella. Department of Molecular Cellular Biology, Harvard University, Cambridge, MA 02138. Flagellated bacteria, such as Escherichia coli, swim by rotating thin helical filaments, each driven at its base by a reversible rotary motor, powered by an ion flux. A motor is about 45 nm in diameter and is assembled from about 20 different kinds of parts. It develops maximum torque at stall but can spin several hundred Hz. Its direction of rotation is controlled by a sensory system that enables cells to accumulate in regions deemed more favorable. We know a great deal about motor structure, genetics, assembly, and function, but we do not really understand how it works. We need more crystal structures. All of this is reviewed, but the emphasis is on function. Expected online publication date for the Annual Review of Biochemistry is June 2, 2003. Please see http://www.annualreviews.org/catalog/pub_dates.asp for revised estimates. Annu Rev Microbiol. 2003 May 1 [Epub ahead of print]. Epub 2002 Mar 22. Department of Molecular Biophysics & Biochemistry, Yale University, New Haven, CT 06520-8114. The bacterial flagellum is both a motor organelle and a protein export/assembly apparatus. It extends from the cytoplasm to the cell exterior. All the protein subunits of the external elements have to be exported. Export employs a type III pathway, also utilized for secretion of virulence factors. Six of the components of the export apparatus are integral membrane proteins and are believed to be located within the flagellar basal body. Three others are soluble: the ATPase that drives export, a regulator of the ATPase, and a general chaperone. Exported substrates diffuse down a narrow channel in the growing structure and assemble at the distal end, often with the help of a capping structure. Expected online publication date for the Annual Review of Microbiology Volume 57 is October 13, 2003. Please see http://www.annualreviews.org/catalog/pub_dates.asp for revised estimates. Oligomerization and activation of the FliI ATPase central to bacterial flagellum assembly. Claret L, Calder SR, Higgins M, Hughes C.
Cambridge University Department of Pathology, Tennis Court Road, Cambridge CB2 1QP, UK. FliI is the peripheral membrane ATPase pivotal to the type III protein export mechanism underlying the assembly of the bacterial flagellum. Gel filtration and multiangle light scattering showed that purified soluble native FliI protein was in a monomeric state but, in the presence of ATP, FliI showed a propensity to oligomerize. Electron microscopy revealed that FliI assembles to a ring structure, the yield of which was increased by the presence of a non-hydrolysable ATP analogue. Single particle analysis of the resulting electron micrograph images, to which no symmetry was applied, showed that the FliI ring structure has sixfold symmetry and an external diameter of approximately 10 nm. The oligomeric ring has a central cavity of 2.5-3.0 nm, which is comparable to the known diameter of the flagellar export channel into which export substrates feed. Enzymatic activity of the FliI ATPase showed positive co-operativity, establishing that oligomerization and enzyme activity are coupled. Escherichia coli phospholipids increased enzyme co-operativity, and in vitro cross-linking demonstrated that they promoted FliI multimerization. The data reveal central facets of the structure and action of the flagellar assembly ATPase and, by extension, the homologous ATPases of virulence-related type III export systems. The structure of the helically perturbed flagellar filament of Pseudomonas rhodos: implications for the absence of the outer domain in other complex flagellins and for the flexibility of the radial spokes. Department of Membrane and Ultrastructure Research, The Hebrew University of Jerusalem - Hadassah Medical School, PO Box 12272, Jerusalem 91120, Israel. Bacterial flagella, the organelles of motility, are commonly divided into two classes: 'plain' and 'complex'. The complex filaments are pairwise, helically perturbed forms of the plain filaments and have been reported to occur only in Rhizobium and Pseudomonas. Previously, we reconstructed and analysed the structure of the complex filaments of Rhizobium lupini H13-3 and determined their unique symmetry and origin of the perturbations (Trachtenberg et al., 1986, J Mol Biol 190: 569-576; 1987, 195: 603-620; 1998, 276: 759-773; Cohen-Krausz and Trachtenberg, 1998, J Struct Biol 122: 267-282). Here, we analyse the structure of the flagellar filament of the other known complex filament, that of Pseudomonas rhodos, as reconstructed from electron microscope images. Compared with the filament of R. lupini, the filament of P. rhodos is more flexible, as implied from high-intensity darkfield light microscopy and, although constructed from flagellins of higher molecular weights (59 versus 41 kDa), has similar symmetry. Using cryonegative stained specimens and low-dose, field emission electron microscopy, we reconstructed and averaged 158 filaments each containing 170 statistically significant layer lines. The three-dimensional density maps of P. rhodos clearly suggest, when compared with those of R. lupini and the right-handed Salmonella typhimurium SJW1655, that R. lupini is missing the outer flagellin domain (D3), that the interior of the complex filament is rather similar to that of the plain filament and that the radial spokes (connecting domains D0 and D1), present in individual density maps, average out because of their variability and implied flexibility. Extending the three-start grooves and ridges on the propeller's surface, in the form of an Archimedean screw, may further improve the motility of the cell in viscous environments. Biofilm formation by Pseudomonas aeruginosa wild type, flagella and type IV pili mutants. Klausen M, Heydorn A, Ragas P, Lambertsen L, Aaes-Jorgensen A, Molin S, Tolker-Nielsen T.
Molecular Microbial Ecology Group, BioCentrum-DTU, Building 301, Technical University of Denmark, DK-2800 Lyngby, Denmark. Department of Pharmacology, Copenhagen University, Panum Institute, DK-2200 Copenhagen N, Denmark. Biofilm formation by Gfp-tagged Pseudomonas aeruginosa PAO1 wild type, flagella and type IV pili mutants in flow chambers irrigated with citrate minimal medium was characterized by the use of confocal laser scanning microscopy and comstat image analysis. Flagella and type IV pili were not necessary for P. aeruginosa initial attachment or biofilm formation, but the cell appendages had roles in biofilm development, as wild type, flagella and type IV pili mutants formed biofilms with different structures. Dynamics and selection during biofilm formation were investigated by tagging the wild type and flagella/type IV mutants with Yfp and Cfp and performing time-lapse confocal laser scanning microscopy in mixed colour biofilms. The initial microcolony formation occurred by clonal growth, after which wild-type P. aeruginosa bacteria spread over the substratum by means of twitching motility. The wild-type biofilms were dynamic compositions with extensive motility, competition and selection occurring during development. Bacterial migration prevented the formation of larger microcolonial structures in the wild-type biofilms. The results are discussed in relation to the current model for P. aeruginosa biofilm development. We describe the morphology and behavior of a hitherto unknown bacterial species that forms conspicuous veils (typical dimensions, 30 by 30 mm) on sulfidic marine sediment. The new bacteria were enriched on complex sulfidic medium within a benthic gradient chamber in oxygen-sulfide countergradients, but the bacteria have so far not been isolated in pure culture, and a detailed characterization of their metabolism is still lacking. The bacteria are colorless, gram-negative, and vibrioid-shaped (1.3- to 2.5- by 4- to 10-�m) cells that multiply by binary division and contain several spherical inclusions of poly-�-hydroxybutyric acid. The cells have bipolar polytrichous flagella and exhibit a unique swimming pattern, rotating and translating along their short axis. Free-swimming cells showed aerotaxis and aggregated at ca. 2 �M oxygen within opposing oxygen-sulfide gradients, where they were able to attach via a mucous stalk, forming a cohesive whitish veil at the oxic-anoxic interface. Bacteria attached to the veil kept rotating and adapted their stalk lengths dynamically to changing oxygen concentrations. The joint action of rotating bacteria on the veil induced a homogeneous water flow from the oxic water region toward the veil, whereby the oxygen uptake rate could be enhanced up to six times, as shown by model calculations. The veils showed a pronounced succession pattern. New veils were generated de novo within 24 h and had a homogeneous whitish translucent appearance. Bacterial competitors or eukaryotic predators were apparently kept away by the low oxygen concentration prevailing at the veil surface. Frequently, within 2 days the veil developed a honeycomb pattern of regularly spaced holes. After 4 days, most veils were colonized by grazing ciliates, leading to the fast disappearance of the new bacteria. Several-week-old veils finally developed into microbial mats consisting of green, purple, and colorless sulfur bacteria. Nic, there is no such thing as a protein complex of Spa47. It's ficticious, imaginary, like Santa Clause, the Easter Bunny, Pumpkin Head, the Matrix, X-men, spider-man, super-man, echo and the bunnymen(actually they exist). It's made up. Of course it fits, the whole thing is imaginary. How can it be a confirmed prediction? Once the post-doc finds it (or something like it) then the prediction that the model makes can be confirmed. A previous report has indicated that His-tagged FliI can exist in monomeric form (Minamino and Macnab, 2000a), and our gel filtration and multiangle light scattering analysis of the native soluble enzyme confirmed this earlier work; all FliI was recovered as the monomeric form. However, when we incubated the enzyme with its substrate ATP, it was evident that FliI has a tendency to oligomerize. Electron microscopy and two-dimensional image processing of FliI stabilized by the non-hydrolysable ATP analogue AMP-PNP revealed that the ATPase assembles to ring structures that exhibit a strong sixfold symmetry around a central cavity, which may represent a central channel. The data, achieved without the application of any symmetry, indicate that FliI is possibly a homohexamer. Such a structure would be comparable to that of the ATPases of the distinct type IV protein export pathway in Helicobacter pylori and E. coli, ascertained by comparable means (Krause et al., 2000a,b). Our data also revealed that ATPase activity of FliI displays positive co�operativity, indicating interactions between subunits, i.e. FliI oligomerization is coupled to activation of the enzyme. Tracing pathways of transport protein evolution. We have conducted bioinformatic analyses of integral membrane transport proteins belonging to dozens of families. These families rarely include proteins that function in a capacity other than transport. Many transporters have arisen by intragenic duplication, triplication and quadruplication events, in which the numbers of transmembrane alpha-helical hydrophobic segments (TMSs) have increased. The elements multiplied may encode two, three, four, five, six, 10 or 12 TMSs and gave rise to proteins with four, six, seven, eight, nine, 10, 12, 20, 24 and 30 TMSs. Gene fusion, splicing, deletion and insertion events have also contributed to protein topological diversity. Amino acid substitutions have allowed membrane-embedded domains to become hydrophilic domains and vice versa. Some evidence suggests that amino acid substitutions occurring over evolutionary time may in some cases have drastically altered protein topology. The results summarized in this microreview establish the independent origins of many transporter families and allow postulation of the specific pathways taken for their appearance. Evolution of small integral membrane transporters from one, two or three TMS precursors As noted above, many channel proteins/peptides exhibit just one or two TMSs (Fig. 1A). We currently have no proof of an intragenic duplication event allowing a primordial single TMS protein or peptide to give rise to a two TMS protein. However, one family of two TMS proteins, the bacterial type III target cell pore (III TCP) family (TC #1.C.36), gave comparison scores in excess of 9 SD (20� 30% identity; 65�80% similarity) when the first and second TMSs were compared (X. Zhou and M. H. Saier, Jr., unpublished results). Because the regions compared were short ( < 30 residues), we do not consider that these values establish homology (Saier, 1994; 2000a). This illustrates the difficulty in evaluating statistical significance for comparisons made between very short protein sequences. Our failure to establish homology in such cases probably does not reflect the absence or rarity of such duplications during evolutionary history. An example of a three TMS�four TMS interconversion exists in the Mot/Exb superfamily (TC #1.A.30; Cascales et al., 2001; Table 3). MotAB serves as a proton channel that allows bacterial flagellar rotation to be coupled to the proton motive force (pmf) by catalysing transmembrane proton flux. The MotA and MotB proteins together comprise the H+ channel. MotA is a four TMS protein, whereas MotB is a one TMS protein. Homologues of the MotA�B pair include the ExbB�D pair, which together are believed to provide the proton channel that allows the pmf to drive active transport across the outer membrane of the Gramnegative bacterial envelope (Cascales et al., 2001). The three TMS ExbB protein is homologous to the four TMS MotA protein, whereas the one TMS ExbD protein is homologous to MotB. The N-terminal TMS of MotA is lacking in ExbB. Although it is impossible to know whether a three or four TMS protein was the precursor of these homologues, it is clear that three and four TMS homologues have arisen by the gain or loss of an N-terminal TMS. The several dozen examples that have been cited in this review provide an emerging picture of how the majority of transmembrane transport proteins probably evolved. The primordial systems were simple one, two or three TMS peptides that could form flexible oligomeric channels. These provided simple transmembrane diffusion functions with low degrees of substrate selectivity. A need for higher degrees of specificity, for coupling two or more transport processes (i.e. co-transport, antiport) and for energy coupling for solute accumulation or expulsion provided the driving force for carrier evolution. The formation of stereospecific binding sites, strict stoichiometric recognition and conformational coupling either within the transporter polypeptide chain itself or with other superimposed energy-coupling subunits were all required. Such requirements resulted, first, in the evolutionary appearance of more constrained channels that could assume carrier functions, secondly, in the appearance of larger, more complex obligatory secondary carriers that could no longer catalyse passive diffusion and, thirdly, in the emergence of primary active transporters and group translocators with superimposed energy-coupling subunits. Thus, the ancestral precursors of all these transporter types were simple peptide channels. The pathways most frequently taken were evidently tandem intragenic duplications giving rise to larger helical bundles that had the potential to form discrete stereospecific intramembranous substrate binding sites. They could also be constrained for coupling to other transport processes and, through conformational coupling, they were subject to control by a superimposed primary energy-yielding process such as ATP hydrolysis. We assume that none of these requirements could be satisfied by the ancestral one, two or three TMS polypeptides that served as the ancestral precursor as no such carrier has yet been documented in the scientific literature. Thus, the primary advantages provided by intragenic duplication or triplication to generate large transmembrane proteins over oligomerization of smaller peptides were (i) specificity; (ii) stoichiometric transport coupling; and (iii) control by energy expenditure. These last two processes allow accumulation of specific solutes within or expulsion of solutes from a cell, processes that simple channels are incapable of catalysing. Experimental confirmation of this proposal will require a combination of bioinformatic and molecular biological approaches. The functional consequences of the proposed structural constraints are likely to prove more difficult to ascertain than the structural constraints them-selves. Future studies are likely to shed light on such structure�function relationships, particularly as three-dimensional structures of more transport proteins become available. They should also allow more extensive documentation of the evolutionary pathways identified here and reveal new types of evolutionary processes not yet recognized. Multiple approaches should allow definition of the requirements for flexibility and rigidity in the construction and evolutionary modification of transport proteins. Peabody, C. 2003, "Type II Protein Secretion and its Relationship to Bacterial Type IV Pilli and Archael Flagella"
...which apparently has not yet been published but which surely is going to be important. Biochim Biophys Acta. 2002 May 3;1562(1-2):6-31. Protein-translocating outer membrane porins of Gram-negative bacteria. Yen MR, Peabody CR, Partovi SM, Zhai Y, Tseng YH, Saier MH. Division of Biology 0116, 9500 Gilman Drive, University of California at San Diego, La Jolla, CA 92093-0116, USA. Five families of outer membrane porins that function in protein secretion in Gram-negative bacteria are currently recognized. In this report, these five porin families are analyzed from structural and phylogenetic standpoints. They are the fimbrial usher protein (FUP), outer membrane factor (OMF), autotransporter (AT), two-partner secretion (TPS) and outer membrane secretin (Secretin) families. All members of these families in the current databases were identified, and all full-length homologues were multiply aligned for structural and phylogenetic analyses. The organismal distribution of homologues in each family proved to be unique with some families being restricted to proteobacteria and others being widespread in other bacterial kingdoms as well as eukaryotes. The compositions of and size differences between subfamilies provide evidence for specific orthologous relationships, which agree with available functional information and intra-subfamily phylogeny. The results reveal that horizontal transfer of genes encoding these proteins between phylogenetically distant organisms has been exceptionally rare although transfer within select bacterial kingdoms may have occurred. The resultant in silico analyses are correlated with available experimental evidence to formulate models relevant to the structures and evolutionary origins of these proteins. How might these ATPases catalyze processive protein export? Spa47 (the Shigella FliI homolog) shares 33% amino acid identity with the beta-subunit of F1-ATPase. Proteins with &gt;30% sequence identity have a high probability of sharing similar structures (69). Active F1-ATPase is a heterohexamer consisting of alternating alpha- and beta-subunits with a gamma-subunit inserted in a central channel where it rotates during the catalytic cycle (70). No equivalent of the alpha-subunit of F1-ATPases is found within flagellar or TTSS-encoding operons, so we assume that the type III export motor is a homohexamer. When modeled on the F1 structure, Spa47 fits at the inner membrane base of our NC structure (Fig. 3). It would contain a central channel aligned with the one found within the NC and of similar diameter to it, through which the proteins could be secreted (see Supporting Text). ...the assumption of homology seems to be confirmed by the fact that the resulting protein complex fits well into their model of T3SS structure. 4. Note that it just happened to fit, even though it was perfectly possible that the structures would have been the wrong size to fit. This strengthened the inference of homology. Source: Blocker A, Komoriya K, Aizawa S. Proc Natl Acad Sci U S A 2003 Mar 18;100(6):3027-30. Type III secretion systems and bacterial flagella: Insights into their function from structural similarities. I read the paper last night, and it seems you are quite wrong about this. There is no evidence for a Spa47 protein complex, a fliI that is homologous to the b subunit of the F-ATP synthase. What is shown in green in fig 3 in the paper is only an imaginary model of Spa47 based on the F1 structure and that model can be successfully docked to the real NC outline where they would imagine it would have to sit to pump secrete proteins into the channel. The evidence here is pretty weak. Everytime you show me a list of citations, the first few turn out to be a wild goose chase, as with the Spa47 paper. As I already showed, Dembski's calculation is not like assembly a plane through a tornado in a junkyard. It is precisely attempting to find a forward-chaining of events that would have selection as the driving force all the way up mount improbable. I raised (here) other examples of important facts that Dembski calculation didn't take into account, for example ExbBD-MotAB homologs, internal homologies of the axial proteins (rod-hook-linkers-filament), and analogies showing how various intermediate non-flagellum stages could still be functional. 1) For awhile he argued strenuously ("near certainty") for the external-proton-channel model of MotAB's motor mechanism. Evolutionary considerations and homology with ExbBD indicate an internal channel, and in fact all of the most recent papers appear to now endorse the internal channel model. 3) Nelson argued that nonflagellar filaments had to be assembled from the base rather than the tip, but this was also disproven by the Hrp pilus and other Type III pili. 4) Nelson argued that the distribution of ExbBD was more restricted than the distribution of MotAB, indicating that ExbBD was derived, but the existence of ExbBD but not MotAB in cyanobacteria and archaea disproved that. 5) Was his assertion that the evidence was weak for the homohexamer model for FliI/Spa47. And yet, the Blocker et al. proposal, clearly based on common evolutionary reasoning, appears to have won out here also. But now we have Nelson saying that he wasn't expressing doubts, and Mike Gene saying he wished he'd predicted the homohexamer model, and Nelson saying "what Mike Gene said"! (even though MG's flagellum essays were clearly the source of Nelson's claims #1 and #2, perhaps #3, and IIRC MG tried out #4 on ARN a few months before Nelson tried it here! I'm not sure we could have a clearer case of ID thinking consistently leading to the wrong answers on a variety of specific empirical questions. The truly interesting stuff comes from the FliI and F ATPase subunit comparison. The essence of their similarity revolves around the ATP-binding domain. At first glance, this doesn�t seem too useful in distinguishing between common design and common descent, as one might expect ATP-binding motifs to be reused in different contexts from either perspective. But what seemed to indicate a hodgepodge use of this motif was that it appeared to be used as a monomer in the flagella. There didn�t seem to be any type of design logic behind its reuse. Genetic and biochemical analysis of Salmonella typhimurium FliI, a flagellar protein related to the catalytic subunit of the F0F1 ATPase and to virulence proteins of mammalian and plant pathogens. Dreyfus G, Williams AW, Kawagishi I, Macnab RM. Department of Molecular Biophysics and Biochemistry, Yale University, New Haven, Connecticut 06511-8148. FliI is a Salmonella typhimurium protein that is needed for flagellar assembly and may be involved in a specialized protein export pathway that proceeds without signal peptide cleavage. FliI shows extensive sequence similarity to the catalytic beta subunit of the F0F1 ATPase (A. P. Volger, M. Homma, V. M. Irikura, and R. M. Macnab, J. Bacteriol. 173:3564-3572, 1991). It is even more similar to the Spa47 protein of Shigella flexneri (M. M. Venkatesan, J. M. Buysse, and E. V. Oaks, J. Bacteriol. 174:1990-2001, 1992) and the HrpB6 protein of Xanthomonas campestris (S. Fenselau, I. Balbo, and U. Bonas, Mol. Plant-Microbe Interact. 5:390-396, 1992), which are believed to play a role in the export of virulence proteins. Site-directed mutagenesis of residues in FliI that correspond to catalytically important residues in the F1 beta subunit resulted in loss of flagellation, supporting the hypothesis that FliI is an ATPase. FliI was overproduced and purified almost to homogeneity. It demonstrated ATP binding but not hydrolysis. An antibody raised against FliI permitted detection of the protein in wild-type cells and an estimate of about 1,500 subunits per cell. An antibody directed against the F1 beta subunit of Escherichia coli cross-reacted with FliI, confirming that the proteins are structurally related. The relationship between three proteins involved in flagellar assembly (FliI, FlhA, and FliP) and homologs in a variety of virulence systems is discussed. Variants of motifs A and B are present in many ATP-utilizing enzymes. However, the degree of agreement between these motifs in FliI and the F0F1 and related ATPases is generally stronger than that between FliI and the ATP-utilizing proteins generally...We conclude that FliI is specifically related to subunits of the F0F1, vacuolar, and archaeabacterial ATPases and not just generally related to nucleotide-binding or nucleotide-utilizing proteins as a whole. "But what would the evolutionary intermediates have looked like?" The same question remains in play for the micro-wheel. Just to be picky, antlers at least (e.g. deer antlers) do require blood vessels to grow (deer scratch off the velvet before breeding season and then the horns fall off). Other forms of armor etc. I'm not so sure, it depends if they are derived from hair or bones or what. But yes, it's the intermediates that are the key. The twisting blood vessels seem to be impossible to gradually convert into vessels with rotary joints. As for whether car-style wheels, if intelligently designed into a critter, would even be favored vs. legs, I'm not so sure. The african savanna and similar plains areas seem like the most likely places (salt flats and beaches etc. are pretty restricted environments). LaBarbera gave the stock answer. Animals with wheels would have to evolve a circulatory system that could pump fluids through a rotating joint, an unlikely though not impossible development. But LaBarbera further wondered if wheels would really help an organism. The answer is no. LaBarbera also asked himself in what natural environments would wheels actually be useful? It turned out that rolling forms of locomotion��the equivalents of wheels��have evolved in those environments where the vegetation is sparse and the landscape is relatively flat. On the African savanna, for example, dung beetles make little balls out of elephant dung, which they use to feed their larvae. And the American Naturalist article that the question inspired continues to be LaBarbera�s most frequently requested reprint. American Naturalist, Vol. 121, No. 3. (Mar., 1983), pp. 395-408. The scarcity of rotating systems in nature is a function primarily of the limited utility of such systems in natural environments; constraints intrinsic to biological systems (such as physiological problems of nutrient supply) are of secondary importance. In aquatic environments, rotating systems are advantageous only at low Reynolds numbers; in terrestrial environments, rotating systems are feasible as a form of transportation only on relatively flat, open terrain and become less useful as the size of the rotating element decreases. Prokaryotic flagella are popularly believed to be the only rotating system in nature, but dung beetles and tumbleweeds also use such systems for transportation. Whenever rotating systems are a feasible mode of transportation, organisms have evolved that use these systems. Myxococcus xanthus glides over solid surfaces without the use of flagella, dependent upon two large sets of adventurous (A) and social (S) genes, using two different mechanisms of gliding motility. Myxococcus xanthus A S double mutants form non-motile colonies lacking migratory cells at their edges. We have isolated 115 independent mutants of M. xanthus with insertions of transposon magellan-4 in potential A genes by screening for insertions that reduce the motility of a mutant S parental strain. These insertions are found not only in the three loci known to be required for A motility, mglBA, cglB, and aglU, but also in 30 new genes. Six of these new genes encode different homologues of the TolR, TolB, and TolQ transport proteins, suggesting that adventurous motility is dependent on biopolymer transport. Other insertions which affect both A and S motility suggest that both systems share common energy and cell wall determinants. Because the spectrum of magellan-4 insertions in M. xanthus is extraordinarily broad, transposon mutagenesis with this eukaryotic genetic element permits the rapid genetic analysis of large sets of genes that contribute to a complex microbial behaviors such as A motility. Among the genes identified in this study are those previously shown to be required for A-motility, cglB, aglU and mglA. Of the new genes identified, those whose products share similarity with TolQ, TolR, and TolB (aglS, aglT, aglU, aglV, aglW, aglX and aglY) comprise the largest group of genes whose products have related functions. The Tol proteins are known to function in transport and may encode structural components of the A-motility motor. The finding that homologues of Tol proteins are involved in A-motility is consistent with a model in which A motility is powered by the secretion of polyelectrolyte (Wolgemuth et al., 2002). In E. coli, TolA, TolQ and TolR interact to form a heteroligomeric membrane-associated macromolecular transport complex required for both biopolymer transport and outer membrane stability. The periplasmic TolB protein interacts with TolA and the outer membrane lipoprotein, Pal, to mediate contact between the inner and outer membranes (Walburger et al., 2002), which facilitates transport and maintains membrane integrity (Lazzaroni et al., 1999). In E. coli, mutations in tolB are pleiotropic, confer hypersensitivity to detergents, and result in the release of periplasmic proteins into the medium of growing cultures (Bouveret et al., 1995). The TolQ-TolR proteins energize TolA and share homologies with the flagellar motor proteins MotA-MotB. Cascales E, Lloubes R, Sturgis JN. Laboratoire d'Ingenierie de Systemes Macromoleculaires, Institut de Biologie Structurale et Microbiologie, CNRS, 31 Chemin Joseph Aiguier, 13402 Marseille Cedex 20, France. ...and you've got the first genomic homology (of which I was aware) between bacterial flagella and gliding motility.